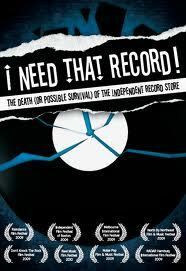 “I Need That Record” was a fantastic little documentary about the death of the independent record store in an age of online piracy. The interviews with business owners and customers make up a bittersweet testimony of the tremendous sense of community that accompanies any store that exists, against all odds, under the shadow of both corporate competition, or the growing number of options through which to purchase entertainment media. Their stories spoke to me as a video store owner, since many of the issues they face are similar for us. Yet the documentary seemed to be about much more. It spotlights the overall loss of community that our society faces as we experience a disconnect from each other. As social network sites grow in popularity, we are left with the question of what happens when we stop interracting with one another in the “real” world? This film may not offer you any pat answers, but it may generate the kinds of questions that prompt you to search out what the changing world means to you.